-The library is a bit labyrinthine in the staff areas. I keep imagining that I will either 1) see David Bowie somewhere or 2) materialize a la Henry from The Time Traveler’s Wife in a terrifying sounding place called “The Dungeon” where apparently they keep the old magazines. -I have my own office and an ID badge that gets me into the building. I have always wanted a name tag/badge because I think it would help me look more grownup. Patrons often mistake me for a high school/college worker and ask me if this is my “summer job.” Blerg. -The staff is big and very friendly. They have made me feel really welcome and had a welcome breakfast one day. So nice! -My first afternoon I hadn’t quite learned how to extend time on the computers – Andover uses a different computer system than Methuen* – and the kids were getting anxious. One teen was grumbling about my ineptitude and another teen said, “Geez! It’s her first day – give her a break! !” He is my new favorite. -I helped a patron at the reference desk via the telephone look up some medical information. Because a “train was going by” I had to shout something about pus on the phone. I even had to spell it. Clare, my fellow YA librarian, kept giggling. 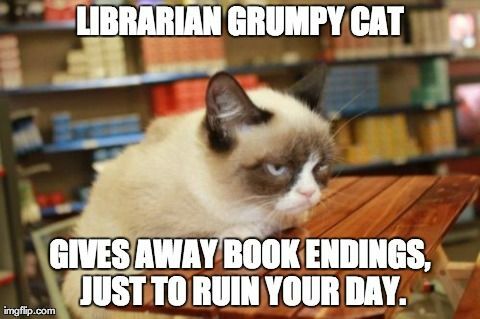 We also made buttons with our button maker – a LITERAL dream come true to work in a library with a button maker – with grumpy cat on them. YES! There’s more but that’s a brief update. I’m really excited about the challenges and opportunities that working at Memorial Hall will offer me. It’s so great so far and hopefully will continue to be so. *Hey Nevins friends! I miss you! ‹ PreviousNew job – Eek! Next ›Books for you! Books for all! Well you did a great job at Nevins and Memorial Hall is lucky to get a great librarian as yourself. Every time I go over in the Teen area at Nevins i always think of what a great job you did Best of luck. Congratulations on your new gig! It’s always a little bittersweet moving from one good place to another, but who could pass up a job that comes with a button maker? It was very magical, Holly! At the very least, I made my coworker’s day by being BRIGHT RED! The pus incident must’ve been funny. I’d hazard a guess that the train was either the rusty cat food can… excuse me… the DownEaster or a freight train. As a former user of the commuter rail, I know that the D.E. causes chaos on that rail line.